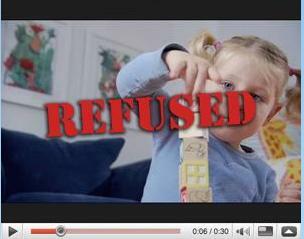 You are here: Home / Advertising / Repower America: A Child + Building Blocks = Censorship? Repower America: A Child + Building Blocks = Censorship? “Did you notice the ads after last night’s presidential debate? ABC had Chevron. CBS had Exxon. CNN had the coal lobby. But you know what happened last week? ABC refused to run our Repower America ad — the ad that takes on this same oil and coal lobby.” Seriously? Has big media gotten THAT big? I immediately went to the ACP ‘We can solve it’ site to see the ad, which trotted out the usual kids-n-futurescape need for preservation…gosh, sure didn’t seem worth flaming it or snuffing it out altogether! Sheesh, if democracy and free speech is really THAT controlled by conglomerate airwaves, we’re ‘inna heapa trouble, boy’ as the ol’ state trooper ads of yesteryear used to say. So what’s the deal? Are we in for the Dixie Chicks and Springsteen/Clear Channel boycott treatment all over again? C’mon ABC. If you can pump in ‘Secret Life of the American Teenager’ that glamorizes teen pregnancy, you can sure as heck show a cute toddler using building blocks with an ominous voiceover and an accusatory script. I tried to find the ABC explanation via Google search, but it was surprisingly off the radar, and the silence was deafening in the blogosphere…What was the big bad message saying? See for yourself. We’re the American people and we approve this message. Sardonic, perhaps. Poignant, indeed. But censorship worthy? Hardly. Boo-hiss, ABC. What gives? Tell us YOUR side of what happened. We want to be fair here! Is this using the power of media for positive change to send a strong voice that the public won’t be silenced? I just visited the ‘We campaign’ blog…and BOTH parties seem to be finding common ground on the issue of clean energy. Evidently coal plants are turning to wind, and there are 20 million new green jobs sprouting up on the horizon. The Program on International Policy Attitudes at the University of Maryland managed the poll. People are finally realizing this is not a ‘left or right but forward’ issue, to benefit humankind.